I should have known that my evening in the Dublin airport would be eventful when the excelerator in the bus that had picked me up in Sligo suddenly stopped working about a mile away from the airport. We began inching our way every so slowly as we drifted in neutral as far as we could go until we just could not go any further. I felt very fortunate that I pack lightly as I was easily able to walk the rest of the way to the entrance hall and check in for my flight the next morning. 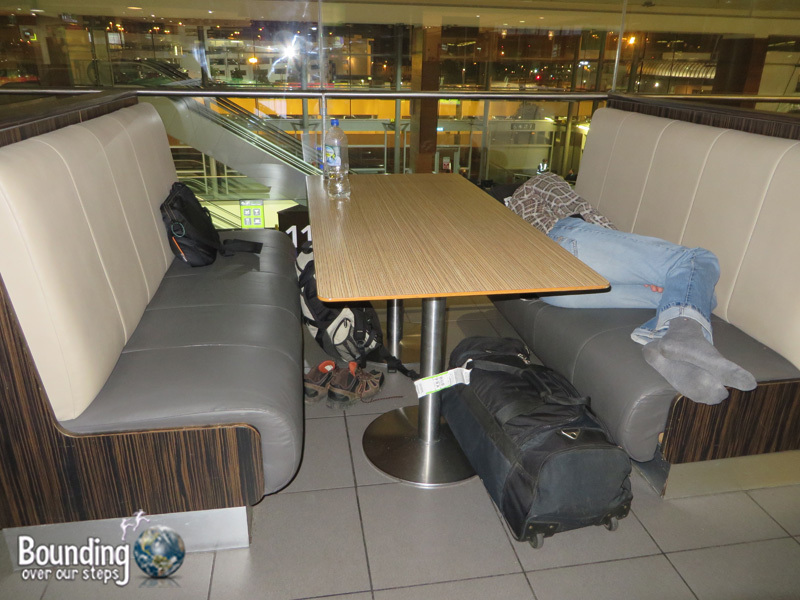 This would not be my first overnight in an airport, having slept in Seoul, Jakarta and Honolulu to name a few, so I quickly learned that the upstairs level in Terminal Two is where most people opt to spend the night given the food court and, in particular, the 24-hour McDonalds. My flight left at 7am the next day and despite the bright lights and noise, the Dublin airport seemed like a better option than spending 150 Euros on a hotel room for only a few hours. Besides, I was there early enough to stake out a good spot. Getting to the airport at 7pm helped me get an entire booth to myself on the second floor of Terminal 2. I knew that eventually the area would fill up and I was bound to end up sharing but I put my bag on the opposite bench so as to prolong having to share it as long as possible. All the stores in the food court, except for McDonalds which I would only use as a toilet while traveling, were closing up so I knew I had to find dinner sooner rather than later. The choices were slim as all the meals had some sort of animal product in them. Finally, I left a store with a bag of popcorn (which surpisingly didn’t have butter) and a bag of potato chips. Certainly not the most exciting meal I’ve ever had but it would have to do. Once the night shift arrived, the cleaning crew came to the upstairs. A friendly woman from Lithuania needed to clean my booth. Never passing up an opportunity to learn about another country, I tried asking her as many questions about Lithuania as possible. Our language barrier was such that I could only get from her that her country was sunnier than Ireland, which was not really all that surprising. Wait…could he be joining ISIS? I really wanted to Skype with Mindy later on and I noticed the battery on my laptop was getting lower and lower and so I had to find a place to recharge while remaining close enough to the booth to be able to still claim it as mine. The closest place to charge turned out to be around the corner but because the walls were made of glass I was able to keep an eye on the booth. Charging seemed to take forever though and so I had to head back to “my spot” only after the battery got to about 65%. Out of the corner of my eye I can see a man in his 20’s slowly approach the table. From the look on his face I could tell that he wanted something. With a very strong Portuguese accent and armed with only about 10 English words, I somehow figured out that he wanted to know if there was a bus going from Marrekesh to Algiers. “Only one website”, he kept saying. This was the last thing I wanted to do, but as a traveler myself I know what it’s like to need information while traveling and of course I could understand the language barrier issue. So I spent some time as I watched my battery continue to fall to find out that there was a train going between the two cities of interest. Then he wanted to know how to get from Algiers to Tunisia and he ultimate goal was Egypt. At that point, I was done. I decided that I was neither his mother nor a travel agent and I had no interest in helping him plan his trip across northern Africa. I told him that he should use the airport internet stations instead and although he probably didn’t understand my words, he could tell that my help session was over because of the irriated look on my face. A few minutes after he had gone, however, I started thinking about his itinerary and how strange it was. He had most likely come from Brazil and was spending the night in Dublin on his way to Morocco. But I couldn’t figure out why someone would then get to Egypt via busses or trains through Algeria and Tunisa. Why not just fly into Cairo instead of Marrekesh? And it didn’t seem like he was spending time in each place, making it like a tour. It seemed like he was purposely trying to disquise his movements and I couldn’t figure out why. Then the thought occurred to me that he might be joining ISIS. Is this possible? Well, he was the right age, was travelling alone and had a huge rucksack with him like he was planning to either be gone for a long time or was moving. “Maybe I can talk him out of it”, I thought. I quickly stood up and looked for him in each direction but there was no trace of him. I really hope I was wrong about him. It became later and later and the place was filling up with fellow travelers and I knew it was only a matter of time before the other side of my booth would be occupied. I began to look for a woman traveling alone like me so I could offer to share with her, but all the women were traveling with at least one other person. Damn! And then it happened. I could see a man approaching and sure enough he asked (so politely) if he could share the booth with me. I motioned for him to join me and he seemed grateful. “Maybe this won’t be so bad after all”, I thought. But as soon as he sat down he started coughing and reeked of cigarettes. In between coughs he sneezed several times all over the table. Thankfully, he laid down shortly thereafter and fell asleep. “Ok”, I thought, “the worst was over”. But wait, what the hell was that smell?! Vinegar? He had taken off his shoes and the smell was wafting over to me! Oh god, how could this get any worse?! My room for the night with the stinkiest roommate! Well, it did! 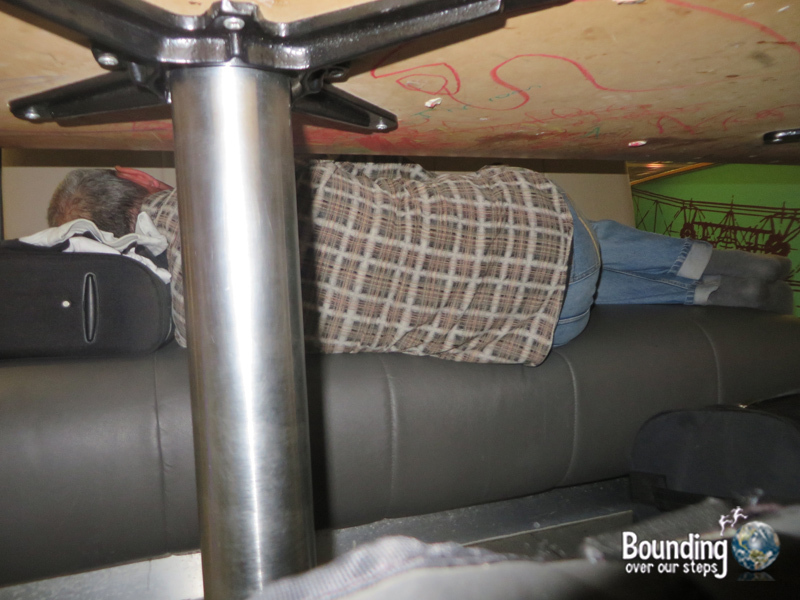 He started snoring, lightly at first and then louder and louder and pretty soon he was attracting the attention of folks in other booths causing me to receive pity looks and laughs from my fellow travelers. He then woke himself up with some sort of snort and lay on his back. I knew this would not be good. Sure enough, his mouth started falling open until it became a gaping hole in his face and the snoring got even louder. And just to be sure to offend all my senses at any given time, whenever anyone walked by, another waft of his nasty vinegar feet reach my nose. I eventually managed to fall asleep despite the noise and bad smells, which I tried to cover up by putting the sleeve of my jacket up to my face. At one point another snort from my booth mate awoke me with a start and he was starring right at me under the table with wide eyes, presumably having just woken up himself, ugh! Imagine him turned around and starring you in the face! I set the alarm for 5am but woke up well before and starting watching people on the floor below me arriving to the airport with carts full of bags. For the first time since I had arrived I needed to go to the bathroom. This was bound to happen eventually. So the question of how to do this while securing both my things and my precious spot (despite my roommate) rattled around in my head for a bit, before I simply grabbed my laptop bag, insuring that my passport and plane ticket were in there, and darted for the bathroom. Thankfully I am a VERY fast pee-er and was back before my tired fellow travellers would get any bad ideas in their heads. Shortly after I got back, however, I realized that I simply couldn’t sleep anymore and so I decided to go to my gate early. Too bad I didn’t get the chance to say goodbye to my boothmate! I wonder who got my spot after I left. I’m about to stay the night in Dublin so…good to know that it can be done. Thanks for the info!